I confess, I went to a wonderful few days at Green Mountain Rughooking School, and I took no photos for the blog. If I take photos of other people’s rugs, I then have to wander around and find them to get permission to show them. Maybe the photos are all over facebook, but on the blog, that’s how I do things. So I took a blog vacation in favor of sitting with friends and just hooking, hooking, (visiting, eating, telling stories, laughing, comparing projects and…) hooking. Above, you see my current project, started in mid-May. 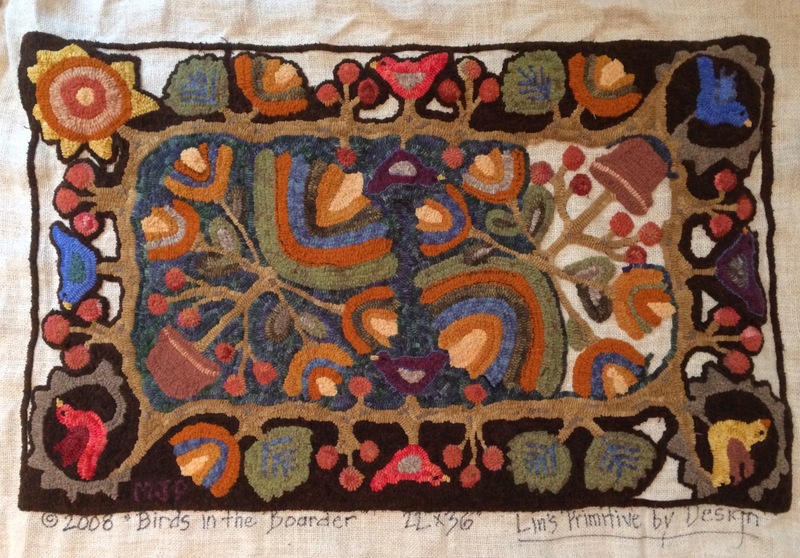 I wanted a rug to do in a wider cut than I have tried before – an #8 cut – and was not feeling very creative, so I ordered this pattern, called Birds In The Border, by Lin Wells of Lin’s Primitive by Design. I liked that it was sort of symmetrical, but not completely symmetrical. And in choosing my colors, I made sure that I continued this slight unsymmetricality. Is that a real word? Well, you know what I mean. I used the same group of colors for the small and large flowers, but changed the order and pattern of them. And how did I do, using a #8 cut for the first time? Just fine! I expected to have to work harder to pull my loops, but really, it felt just like hooking with my usual #6 cut. I do use a hook with a fairly thick shank, even when working with a #5 or #6, so maybe that is why I had no difficulty. I just had to remember to space out my loops a little more than I usually do, since even with a #6, I tend to pack my loops in. The other great thing about this design is that, once I finished all the design elements (birds, flowers, leaves, vine) there was not that much background to do! One of my favorite parts of hooking is when you put that first row of background around all your design elements. That flower or this leaf looks so different when it is finally surrounded by the background color! And that first background row is what locks your loops into place, so that is the time to nudge a loop a little bit this way or that way to smooth out a curve or a straight line, or give final shape to a bird’s beak or tail. And as you can see, I only have a bit left to do. As I approach the “home stretch” on a rug, I usually have to set it aside to finalize my next project. Then I can relax and finish up the current one. We would never want to find ourselves rug-less, would we?? Hoping you are enjoying the summertime, and that the rug on your frame is coming along, too! Wonderful colors. It’s required to just sit and enjoy hooking. Love your rug. Choice of colors is really nice. Hope to see finished rug. Looking so good, Mary Jane! This rug is great, MaryJane. Your colors make it sing! You know, it’s only a small jump from an 8 cut to an 8-1/2 . Your work is very inspiring.